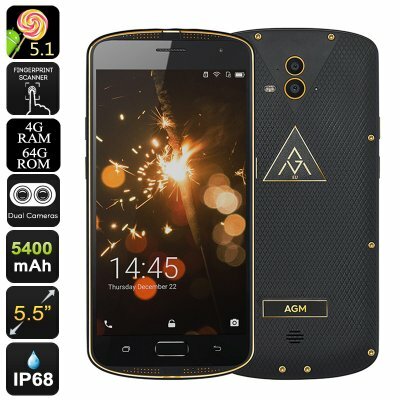 Successfully Added AGM X1 Rugged Android Smartphone - 18K Gold Plated, IP68, 4GB RAM, Octa-Core CPU, Dual-Camera, 5400mAh, Quick Charge, OTG (Gold) to your Shopping Cart. The AGM X1 gold plated rugged phone is the perfect Android smartphone for those of you that are looking for something special. Its black body comes with stylish 18K gold plated edges and screws – giving it a magnificent and extraordinary look. Not only does the design of this phone look stunning, it is furthermore rated IP68. This means that the AGM X1 Android phone is fully resistant against water, dust, drops, and more. No matter where your upcoming adventure will take you, this rugged Android phone will never let you down. To ensure that you’ll always stay connected, even while out in the wild – this rugged phone supports 4G connectivity, Dual-Band WiFi, and Dual-IMEI numbers. Whether you’re at home, in the office, or enjoying a hike outside – with this rugged phone you’ll always stay connected to friends and family. At the front of this beautiful Android phone, you’ll be able to find a stunning 5.5-Inch display that portraits all media in breathtaking 1080p resolution. Thanks to this, you’ll be able to enjoy your favorite movies, games, and series anywhere and at any time. With 64GB of internal memory, a 128GB SD card slot, and an epic 5400mah battery – you can enjoy countless hours of entertainment throughout the day without ever again needing to worry about battery life. Within its sleek body, this waterproof smartphone packs an Octa-Core Snapdragon CPU that has been clocked at 1.5GHz. Additionally, it comes with 4GB of RAM to truly provide you with a powerful user experience. Running on an Android OS, you can be assured that you’ll be enjoying the latest software features and Applications without any lag. Play demanding games, watch FHD movies, and enjoy the latest Android applications – nothing is too much for this IP68 rugged Android phone. For all of you that wish to snap beautiful pictures and footage during your upcoming outdoor adventures, this rugged Android phone packs a Dual-Lens camera. Coming with a 13MP main camera and a 2MP assistant camera – this smartphone truly allows you to take your mobile photography to the next level. Whether you’re enjoying a simple night out with your friends, or are experiencing a breathtaking view during one of your upcoming hikes – with this Android phone at your side, not a single moment will ever again stay uncaptured. The AGM X1 Android Phone comes with a 12 months warranty, brought to you by the leader in electronic devices as well as wholesale electronic gadgets..